Electro Scan Critical Sewers results integrated with Innovyze InfoMaster for Sewers. Electro Scan’s breakthrough technology evaluates 360-degrees of a pipe wall to accurately locate and measure defects in gallons per minute (GPM) or liters per second (l/s). Recent studies indicate that 70-100% of defects are typically not found by legacy inspection techniques, such as closed-circuit television (CCTV) inspection, smoke testing, dye flood testing, laser profiling, and acoustic sensors. Recommended to assess and certify pre- and post-rehabilitated pipes, a new chapter was recently added on Electro Scanning Inspection to the industry’s leading training manual, Operation and Maintenance of Wastewater Collection Systems, Seventh Edition, Volume One (2015), in accordance with ASTM F2550. “We are delighted to integrate our game-changing pipe condition assessment solution with the leading business analytics solution for the wastewater industry,” states Chuck Hansen, Founder and CEO, Electro Scan Inc.
“The Innovyze family of smart network modeling and asset management solutions continues to be the standard platform for existing and emerging diagnostic tools,” said Paul F. Boulos, Ph.D., BCEEM, Hon.D.WRE, Dist.D.NE, Dist.M.ASCE, NAE, President, COO and Chief Innovation Officer of Innovyze. “We look forward to offering this new layer of condition assessment data to help our clients in their sewer rehabilitation decisions,” continues Boulos. Electro Scan's Critical Sewers cloud application allows for up-to-the-minute monitoring of sewer evaluations, lining projects, point repairs, and new construction projects, while crews are still in the field. Clients can easily identify pipe-specific problems before rehabilitation project acceptance. Wirelessly transmitted to the Company’s award winning cloud application, defect flows are reported in minutes and incorporated into Innovyze InfoMaster for Sewer product for display and analysis. Since Electro Scan’s advanced low voltage conductivity technology does not rely on operator interpretation, third-party data analysis, or independent judgment, a key advantage is its ability to automatically provide specific location, size, and estimated flow for each defect and total pipe. Customers wishing to utilize Electro Scan’s decision support data must be licensed users of Innovyze InfoMaster for Sewer and Electro Scan’s Critical Sewers cloud application, including associated integration module. Once data is accessible, Electro Scan defect flows may be highlighted by location and severity by Innovyze InfoMaster for Sewer, including the identification of defective joints, cracks, and leaking service connections, compared to CCTV inspection results. 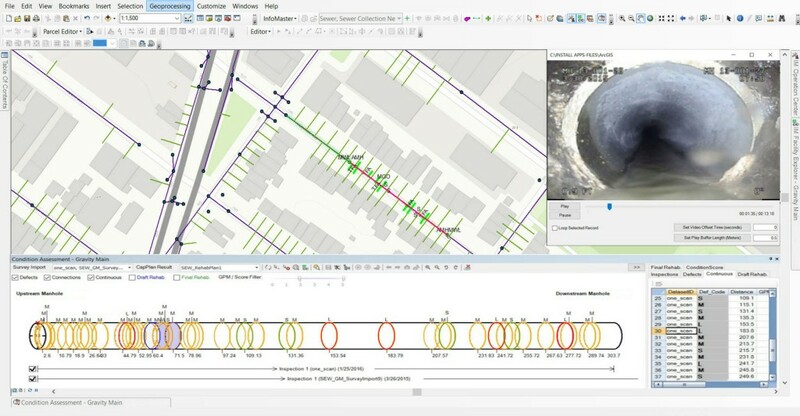 Electro Scan and Innovyze users can show pipe defects ranked by highest GPM and gallons per day per inch diameter mile (GPD/IDM), utilizing Innovyze’s 1D and 2D modeling and mapping features within Innovyze InfoMaster for Sewer product. Plans include the integration of Electro Scan’s 4-in-1 water leak detection probe with Innovyze InfoMaster for Water to assess pressurized water mains.